Boucle Check Supersoft Sherpa Throw is rated 4.9 out of 5 by 10. 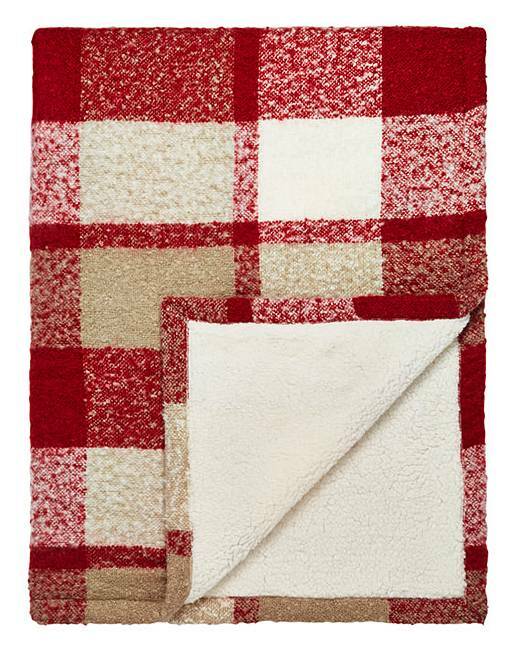 The Boucle check supersoft sherpa throw not only looks fabulous but is a great extra layer for cold nights. Ideal for any area of the home, whether draped over the end of the bed to give added warmth, or in the lounge or garden for cosy nights in. Rated 5 out of 5 by Binnie from Blanket Lovely chunky blanket with fleece lining Awesome!!!!! Rated 4 out of 5 by The raven from Lovely and warm Bought this for my son to keep him warm in his bedroom as has severe cerebral palsy, he feels the cold and this is lovely and soft for to keep him warm especially through the winter night's. Rated 5 out of 5 by Winkle68 from The throw Excellent better than what I thought it would be am going to order another one. Rated 5 out of 5 by JinnyJ from Gorgeous, soft and Warm Absolutely delighted with this. Beautifully soft and warm and looks great too. Rated 5 out of 5 by Linda from Comfortabley/soft My granddaughter loves it. She uses it for lounging on the sofa then takes it to bed with her. Rated 5 out of 5 by Kaz from Perfect snuggle blanket Colours are lovely and warm. The boucle side will catch on dog nails and similar but super soft, washes well and pleased overall. Rated 5 out of 5 by Reidy0 from So cosy I was so pleased with my purchase. The colours were lovely and it was so soft and extremely cuddly. Rated 5 out of 5 by MO78 from Lovely and cost. Brilliant, excellent as a warm cover for wheelchair user this cold weather.